In my imaginary, perfect dream world, I have four students in my classroom. During our reading time, I do a quick whole-group mini-lesson. Then, I spend the remaining time working one-on-one. I see every single student every day. There is no lack of time. (After all, I have only four students.) 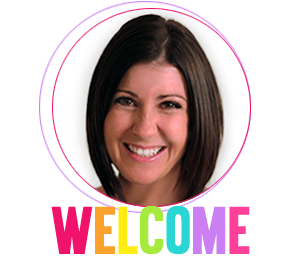 I roam freely from child to child, individualizing my instruction and working solely on what each individual student needs for the entire individualized reading lesson. At the end of the day, I feel satisfied that Theo left with a deeper understanding of context clues. I smile when I think of the time I was able to spend with Carla on r-controlled vowels. At the end of our time together, she was already mastering those new sounds better than the day before. In my actual world called reality, I have between 20 and 25 students. During our reading time, I do a quick mini-lesson, followed by three consecutive small group and guided reading lessons. I don’t see my highest readers every single day. I meet with each group of five to seven children for about twenty to twenty-five minutes a day. The struggle for time is real. I go home at night worried about how much of my time I was able to dedicate to each group. Will that phone call from the office during my lowest group slow down their reading growth? After all, it cut into three whole minutes of the time we spent within the text. When Susie’s scab started bleeding and I sent her down to the nurse, did my highest reading group REALLY understand the vocabulary word we were dissecting at that moment? I scramble from group to group, trying my hardest to meet the needs of as many students as I can within a school day that seems to never have enough time for all of the instruction I need to fit into it. Which of these teaching worlds do YOU live in? One-On-One Instruction: What Does Research Say? I’m going to make a wild assumption that your reality is similar to my reality. One-on-one instruction is TOUGH to fit into the school day when your classroom is packed with students. Nevertheless, it is critical that we do so. Why? For starters, let’s look at what research says about the benefits of one-on-one direct instruction. In a 2017 article in Reading Horizons, Meghan D. Liebfreund and Steven J. Amendum investigated a group of teachers in kindergarten through second grade. The teachers delivered Tier 2 one-on-one instruction to their struggling readers. Positive results were found for these struggling students and the teachers were able to deliver increased feedback due to the relationships that were formed. In an article in the Journal of Reading Recovery by Askew and Simpson (2004), some of the benefits of one-on-one instruction include more active participation from the student and attention on literacy tasks. They explain that the teacher benefits from one-on-one instruction as well, such as freedom from the interfering factors of the group’s needs. While I only cited a couple of resources today, there is a lot of research out there that supports positive results for one-on-one instruction. Clearly, direct 1:1 instruction is powerful for all learners. In the same way that an infant benefits from direct eye contact, smiles, language, and nurturing from a parent, our students thrive when we are able to carve out time specifically for individual instruction. Before we get to the nitty-gritty details of how I find the time to meet with students one-on-one, I think it’s necessary for us to realize that based on a teacher’s routines or reading program, there is not just one right way to fit one-on-one instruction into your day. 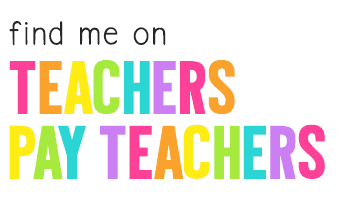 My purpose of this blog post is to share how I have added this into my own classroom, in hopes that it may help another teacher who might not be fitting any one-on-one instruction into his or her daily schedule yet. Now that we know what research says about the importance of one-on-one instruction with our students, how do we find the time in our day to make it happen? My 1:1 instruction takes place during the first five minutes of our small group reading time. This five-minute section of our small group lesson is a non-negotiable for me. It is not something I throw out if we have a fire drill and we’re short on time. It is not something I stick at the end of the lesson and then never get to because another activity’s allotted time ran over. The first five minutes of every small group lesson is solely dedicated to working with ONE focus child from each of those small groups of students. Great question! Let me answer this by having you take a look at what happens when it’s time for a small group of students to meet me at the table for our lesson. Here we go! In order to make the most of ANY small group instructional time, it’s vital that students are able to self-start and know exactly what to do once they reach the small group table. Your students should not need you to get them started once they sit down at the small group reading table. When my students arrive at the small group table, they grab their group’s fluency basket. Then, they start to reread yesterday’s guided reading book. If they finish yesterday’s book, I keep about three to four days worth of previous books that they have read with me in that fluency basket. They continue to read those familiar books during our first five minutes of small group reading. Research shows us that rereading familiar text makes a great impact on fluency and comprehension, so while my focus child is benefiting from 1:1 instruction with me during this time, the rest of the group is benefiting as well. 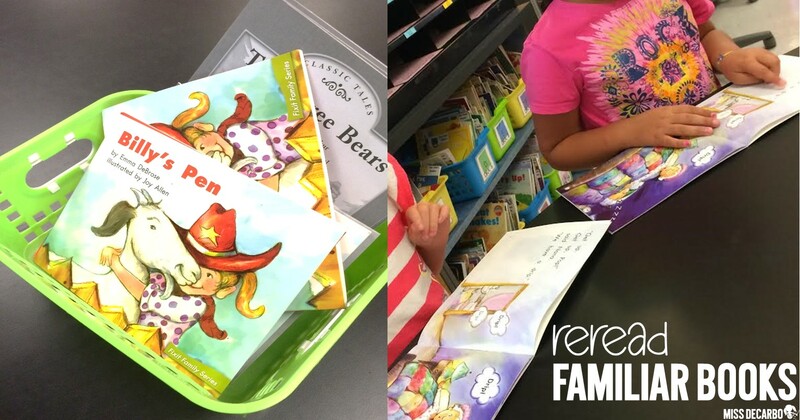 My organizational tip and trick for fluency baskets are to keep two separate bins or baskets for each of your reading groups. One basket houses our familiar books. This is known as our fluency basket. The fluency basket is the one my students immediately put in the middle of the table, grab a book from, and begin reading. The second basket houses the new and upcoming books that I’ve pulled for the group. After we read a new book together, it goes into the fluency basket to be read during the first five minutes of tomorrow’s group time. 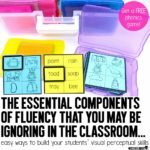 Notice that I don’t get the fluency basket out for them. Notice that I do not say, “You can start reading now.” Notice that my students do not need to sit there and wait for me to get to the small group reading table before they begin engaging with the text. 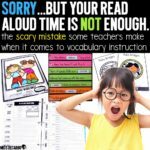 I explicitly teach my students how to self-start their own small group reading lesson. Why? Because every minute of small group time matters and wasted time is time away from the text. Before I talk about what I work on with each focus child, let’s talk about how I choose which student to work with during those first five minutes of each small group lesson. I keep a super simple printable chart in my small group binder that keeps me organized with what students I’ve already worked with, and which students I still need to work with. (You can read about what else I keep in my small group binder here.) As you can see from the photograph above, I simply list the names of the students in my classroom on the left side of the paper. There are three columns across the top. When I work with, for example, Emily, during the first five minutes of group time on Monday, I simply put a check next to her name under column #1. During my second small group of the day, I put a checkmark next to the child I choose from that group. I repeat this for the third child I work with during my last small group reading lesson of the day. The following day, I can see that I’ve already worked with those three children in my classroom. 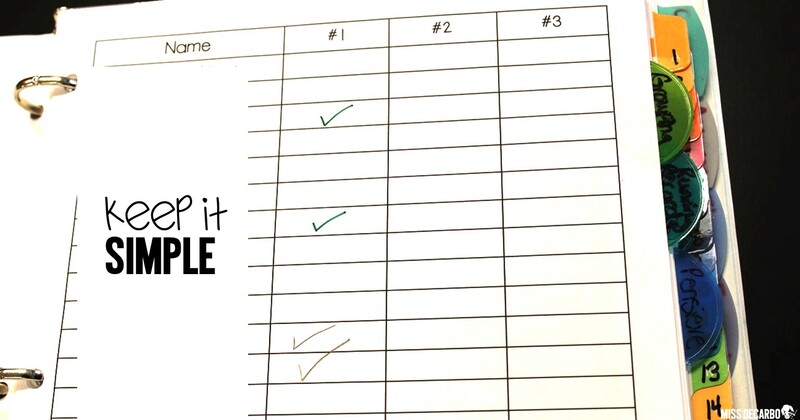 Therefore, when it’s time for my first small group of the day, I simply ask a child from the group to work with me, put a check mark next to his or her name in column #1, and we continue with our lesson. When the entire class has a check mark beside their name under column #1, I know by quickly glancing at my sheet that I have met with every student in my classroom for 1:1 time during small groups. Yay! I then start all over in an attempt to fill up column #2! When column 3 is filled, I simply rip the page out and print off a new one for my binder. Since students are often absent, it allows me to jump around on my classroom list to keep things flexible, yet it ensures I am meeting with all of my students and not accidentally skipping anyone. Since I have three reading groups a day, I’m meeting with three students for one-on-one time every day. Over the course of a week, I’m able to target five minutes of skills or strategies on a one-on-one basis with fifteen students! Since I have between 20 and 24 students in my classroom each year, this means I’m seeing every student for one-on-one instruction about every week and a half. I know five minutes once a week doesn’t sound like a lot at all, but when you’re intentional and working explicitly on a specific phonics skill, sound, letter, or strategy that the child needs for five uninterrupted minutes, you’d be amazed at what a child can accomplish! 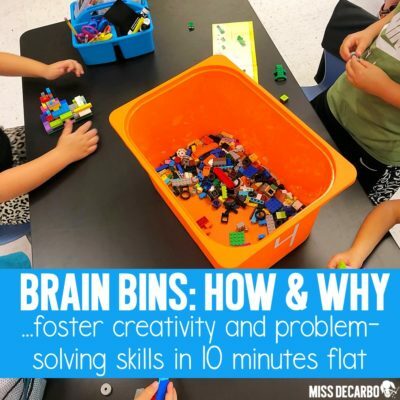 In fact, in Eric Jensen’s book, Teaching with the Brain in Mind , he suggests only 5-8 minutes of direct instruction as an appropriate length of time for students in grades K-2 (2015, p. 37). What we can accomplish in that five minutes can be powerful! I re-created my Focus Child tracking sheet above to be able to offer it to you in this blog post. To make this tracking sheet editable, the file will open as a Powerpoint file. (You’ll need Powerpoint to be able to use it.) From there, you can type in your students’ names on the left-hand side of the page and print it for your reading binder. Simply click on the yellow button below to grab this tracking sheet for free! It’s time for some math. 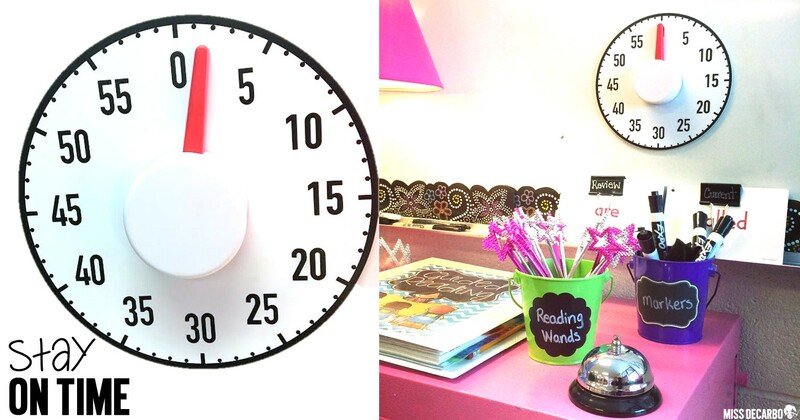 Let’s say you teach three small reading groups each day for twenty minutes each. If you waste three minutes during every group (which is really easy to do), that’s about nine minutes of wasted instructional time each day. Over the course of a five-day school week, that’s 45 minutes of wasted instruction. 45 minutes! Think of what you could do with 45 minutes of teaching time with your young readers. (A LOT!) For this reason, it’s critical to keep yourself on track during your small group time. It doesn’t matter if you’ve been teaching for two years or twenty-five years- use a timer to keep yourself focused and intentional. Set a timer for five minutes (or however long you plan to work with a focus child) and stick to it. When the timer goes off, rereading and 1:1 time is over, and your small group reading lesson begins. What Do I Do With My Focus Child? In the next two sections, let’s dive into each of these two options for our five minutes of one-on-one time. I recently created a resource called the Reading Reference Ring. 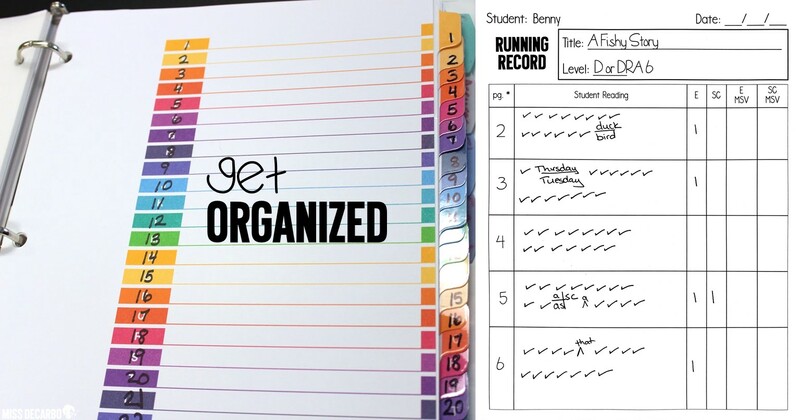 I love sitting down to listen to a student read one-on-one with me during a running record, but some days I wished for some “cheat sheets” of things like how to mark up a running record, prompts I can use when I go back and work on teaching points with the child and even discussion starters that I can. I LOVE how my Reading Reference Ring turned out! It comes in smaller sized pages to clip onto a book ring for a binder or as full pages to print out. These reading reference pages keep me on track during my running record time so that I have focused teaching prompts at my fingertips and I’m not wasting time thinking of discussion questions or teaching points that will benefit the reader during our five minutes together. 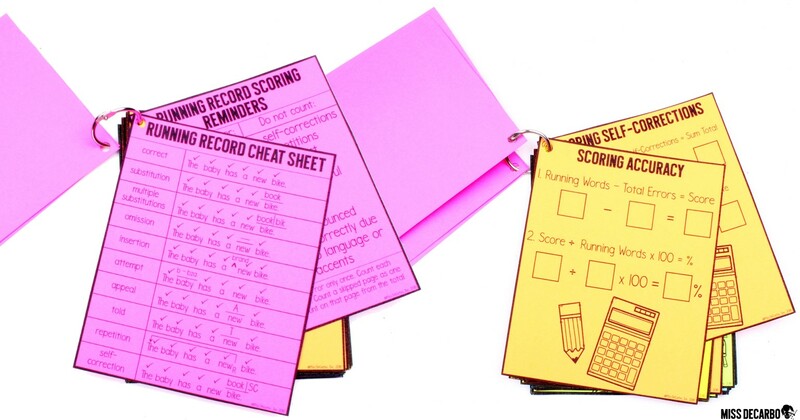 The Reading Reference Ring also has scoring cheat sheets, reminders, and pages to help you remember how to score the accuracy and self-corrections on a running record. 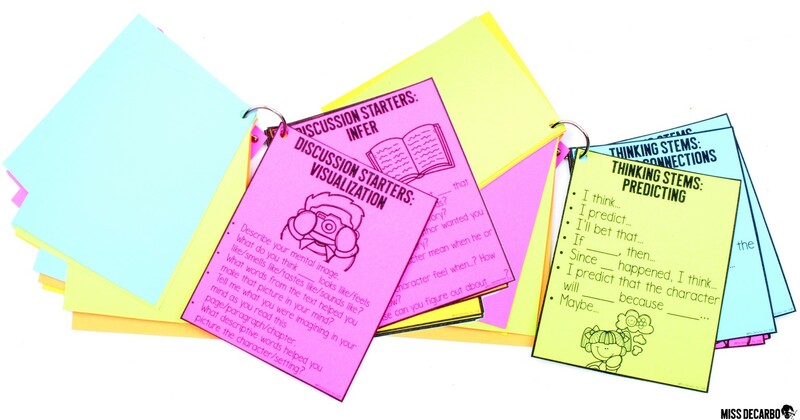 In the photograph below, you’ll see samples of the discussion starter pages for the various comprehension strategies, as well as pages that list thinking stems that students can use during your small group time or while they’re talking with you about the book during your one-on-one reading time. 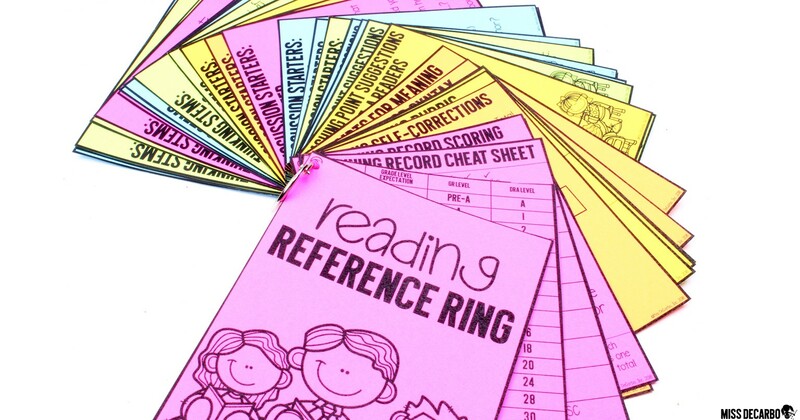 You can grab your copy of my Reading Reference Ring by clicking here and downloading it in my TpT shop. 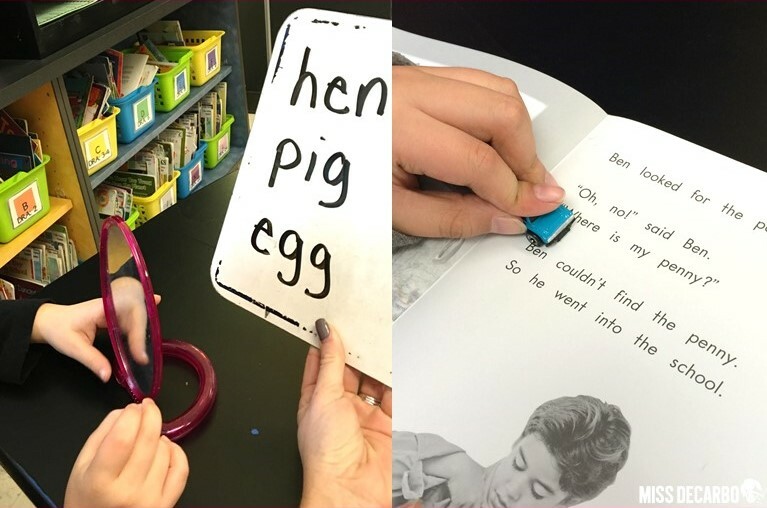 On the left side of the photograph above, I had a young student who was mixing up his understanding of the short e and i vowel sounds. As I completed a running record one day, I noticed his errors all contained words that had either a short e or a short i sound in them. Then, as I studied him even more during our small group time, I noticed his mouth wasn’t making the correct formations for these two sounds. What do you suppose we worked on during our five minutes of targeted 1:1 instruction time? The short e and short i sound! That’s why you see him in this photograph with a mirror and mixed short e and short i words on my whiteboard. We worked together on making sure our mouth was formed correctly as we said each of those sounds. After just a couple times of explicit instruction in this area, he was quickly making great progress! In the picture on the right, I am working with a child who was not struggling on decoding within our guided reading group, but on smoothness while reading. During our five minutes of focused instruction together, we used a toy car and pushed it across the page of a familiar book. 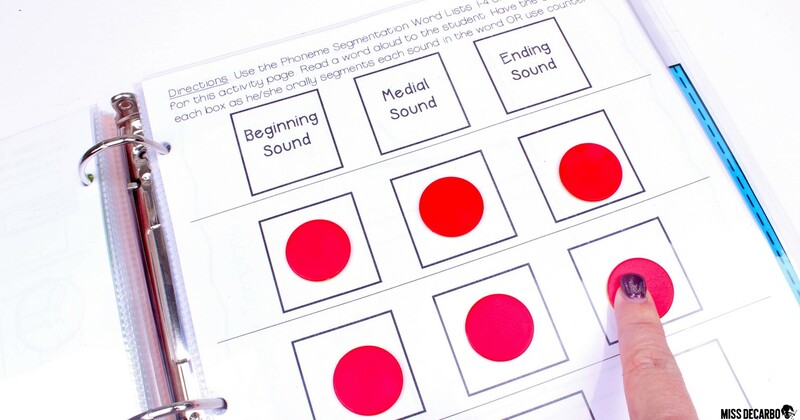 Since this child was moving her eyes word by word, this activity “forced” her eyes to move across the page more quickly and smoothly, therefore getting her out of her comfort zone while she read the familiar text. We continued to work on this for the next few times we met, and it truly made a big difference in fluency progress. Never underestimate the power of intentional one-on-one instruction! How do I know what the child needs help with? Well, the running records I take on my students are one diagnostic assessment that guides my instruction. Other ways that I figure out what to work on with a focus child might be from a grade-level assessment, a computerized assessment such as i-Ready, Raz-Kids, a district assessment, etc. I also really like to use my No Prep ELA Assessment Binder to collect straight-forward data on the phonics skills my students need. 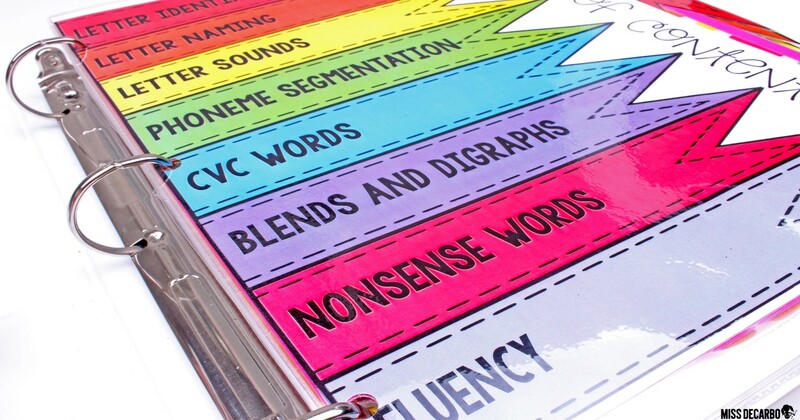 These reading binders are an answered prayer for the teacher who struggles with knowing WHAT to do and WHAT to work on when it comes to targeted phonics and fluency practice with young readers. I love having everything at my fingertips in one easy to use, organized binder. The pages are in sheet protectors and are used with dry erase markers. This means that when I ask a focus child to sit beside me at the beginning of our small group time, I can grab the binder, flip to the section he or she needs to work on, and maximize my five minutes of 1:1 instructional time with that child! 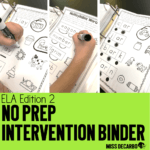 The No Prep Beginning Readers Intervention Binder is the perfect place to start for kindergarten and first-grade teachers. 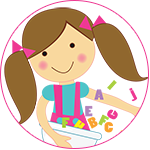 It will work on phonemic awareness and it covers short vowels, CVC words, and short vowel words with blends and digraphs. Each page has the directions at the top so that there’s never a need to waste time figuring out what to do. (It’s even great to give to a volunteer or an aide for one-on-one instruction with them, too!) Below are some sample pages of what you’ll find in the Beginning Reader’s edition. Whatever it is that you decide to use during your 1:1 time, I hope you’ve been encouraged to attempt to add in some one-on-one instructional time into your classroom. 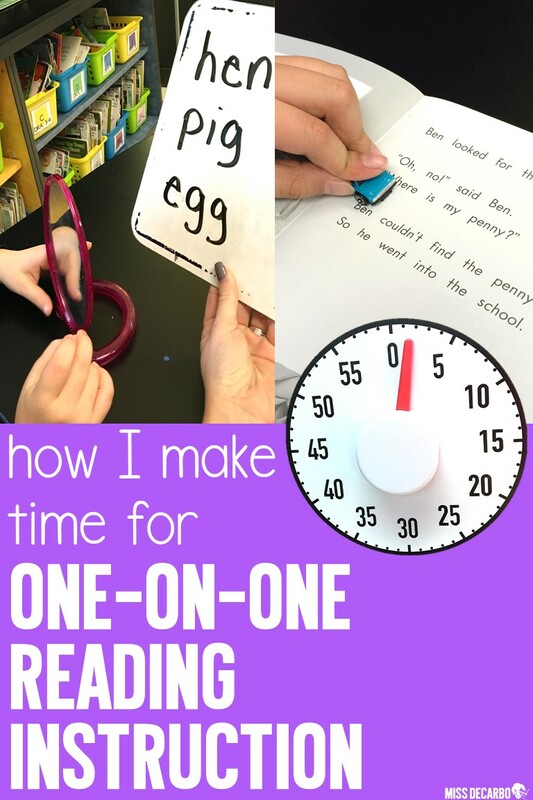 I use my 1:1 time for skills, but you could certainly use that time as built-in reading conference times with your students, too! 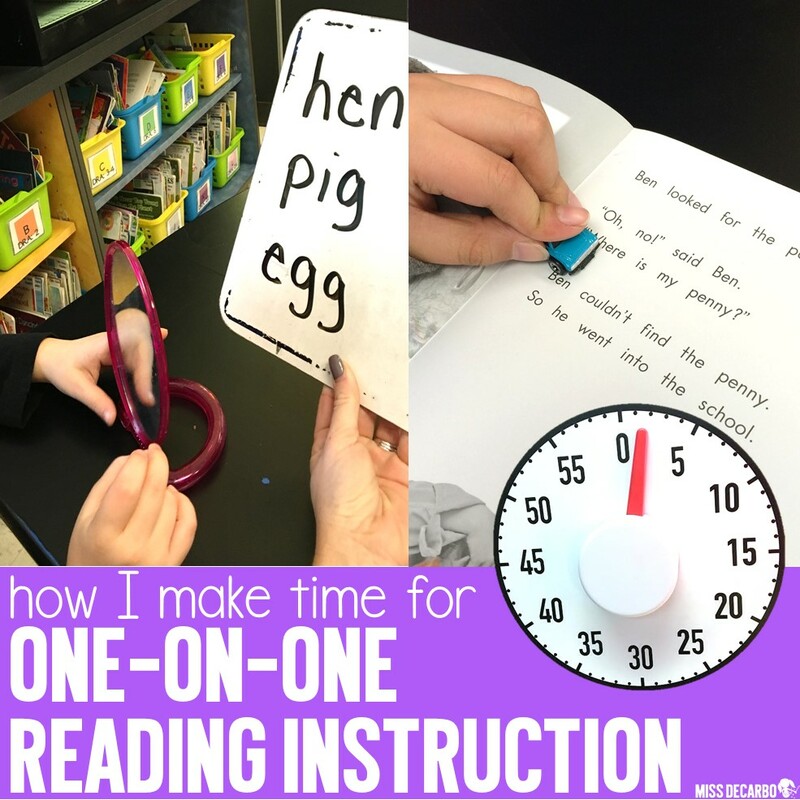 Regardless of what you use or how often you meet with your students, I think you’ll see that regardless of the one-on-one instruction is organized, it’s beneficial, positive, and has the potential to make small but significant gains in the reading development of our students. I know that was A LOT of information for one blog post, so if you have any additional questions, please do not hesitate to contact me using the form at the bottom of this post. I’m always happy to help! Feel free to use the image below to pin on Pinterest and share this post with your friends and colleagues! You can also use the social media buttons at the top of this post to share the content on your social platforms, too. Thank you again for learning about how I add time for 1:1 instruction into my day! I absolutely love this post and certainly needed to read it! I’ve struggled to find CONSISTENT 1:1 time with students and plan on implementing your suggestions this year! I truly can’t wait!!! 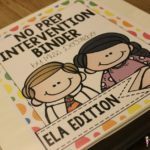 I purchased both of your No Prep Intervention Binders a while back. They’ve been so easy to use and I’m really excited to employ them during my focus student sessions now. I also love the easy self start solutions you have for the remaining small group members. I would like to ask if you have any suggestions or blog posts about what the rest of the class is doing at that time? Helpful reading center strategies maybe? Thank you so much for sharing your brilliance! Thank you so much! I don’t have any blog posts but I use the Daily 5 in my classroom. My best advice is to grab their book on Amazon and soak it up! 🙂 It’s wonderful!